Visio 2016 or the free Visio viewer. If you use the Visio viewer, right-click the VSD link, click Save Target As, save the file to your computer, and then open the file from your computer. This poster describes the SharePoint Online, Microsoft Azure, and SharePoint Server 2016 on-premises configurations that business decision makers and solutions architects need to know about. SharePoint Online (SaaS) - Consume SharePoint through a Software as a Service (SaaS) subscription model. SharePoint Hybrid - Move your SharePoint sites and apps to the cloud at your own pace. SharePoint On-premises - You plan, deploy, maintain and customize your SharePoint environment in a datacenter that you maintain. This poster shows the recommended MinRole topologies in a SharePoint on-premises environment. 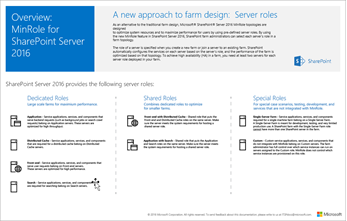 This poster shows the different recommended MinRole topologies that can be deployed in a SharePoint Servers 2016 and 2019 environments. It also shows the associated services that are provisioned with each role type. 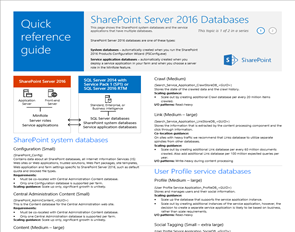 This poster shows the databases that support SharePoint Servers 2016 and 2019. The first page contains the SharePoint system databases and the service applications that have multiple databases. The second page shows all of the service applications that have single databases. 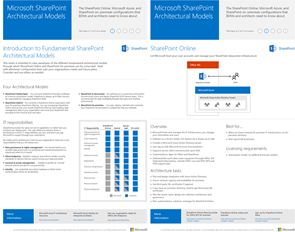 These posters describe search architectures in SharePoint Servers 2016 and 2019. 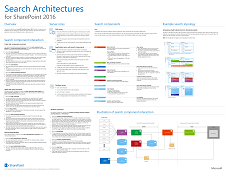 This poster gives an overview of the search architecture in SharePoint Servers 2016 and 2019. It describes the search components and databases in the search architecture and how these interact. It also shows an example of a medium-sized search farm. 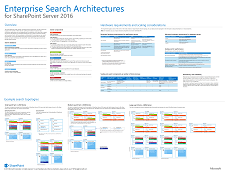 This poster gives an overview of enterprise search architecture in SharePoint Servers 2016 and 2019. It shows sample search architectures for small, medium, and large-sized enterprise search farms. It also gives scaling considerations and hardware requirements. This poster gives an overview of the search architecture for Internet sites in SharePoint Servers 2016 and 2019. It shows a sample search architecture for a medium-sized search farm. It also gives performance considerations and hardware requirements.